Enjoy a family holiday or restful retreat in our Appalachian style log cabin nestled in the pine trees of Willow Cove within walking distance of Bass Lake and the Pines Village. Our chalet style StoneMill home is a custom constructed, hand hewn Hemlock log cabin that offers 3 bedrooms, a sleeping loft, and 2.25 baths. It sleeps 8-12 comfortably. Many features set our cabin apart for your pleasure: Americana style decor, free WIFI, fully functioning kitchen, Rinnai water heating system, games and puzzles, library of children's books and movies, and a clawfoot tub. Ample parking is available on our .71 acre property, along with a sitting grove of Adirondack chairs, hammocks, outdoor twinkle lights, and a spacious deck all under a canopy of pine trees. Bass Lake is centrally located for lake days and Yosemite excursions. Bass Lake provides boating, water sports, beach days, fishing, and hiking for families and outdoor enthusiasts. The gate to Yosemite National Park is merely 18 miles up HWY 41, where you'll find Yosemite Valley, Badger Pass Ski Area, and Mariposa Grove just beyond. Yosemite Valley is a year-round must for your bucket list, showcasing Half Dome, El Capitan, and thousand foot waterfalls and granite that tower above the picturesque Merced River winding through the Valley's grassy floor. In winter on the same Yosemite road, Badger Pass Ski Area is the perfect family resort for snowboarding, skiing, and cross country trails. Snow play is even closer on HWY 41 above Fish Camp. Mariposa Grove is famous for its giant sequoia forest of the oldest and largest trees in the world. Bass Lake is surrounded by the Sierra National Forest. We are the Mount family who has been personally blessed by Bass Lake for over 40 years. We offer our cabin in hopes that your family too will experience the rest, joy, seasons, and beauty that have meant much to us and to our parents, children, and friends. We have been coming to Bass since we were young--Jeff hasn't missed a year since 1976--and since then have experienced a wealth of blessings: our wedding, our holidays, our annual summer vacations with multiple families, our snowboard trips, and countless on- and off-season getaways we share with family and friends. Downtown Pines market and Ducey's resort is a morning walk or one minute drive. Enjoyable short forest trail begins at the top of our hill and meanders towards Willow Cove beaches of Bass Lake. Great for morning walks. Lake beaches are great ways to sun, frolic, and relax. Best to drive your gear to beach accesses that surround Bass Lake end-to-end. We are tucked into Willow Cove, a Bass Lake community within walking distance of the lake. 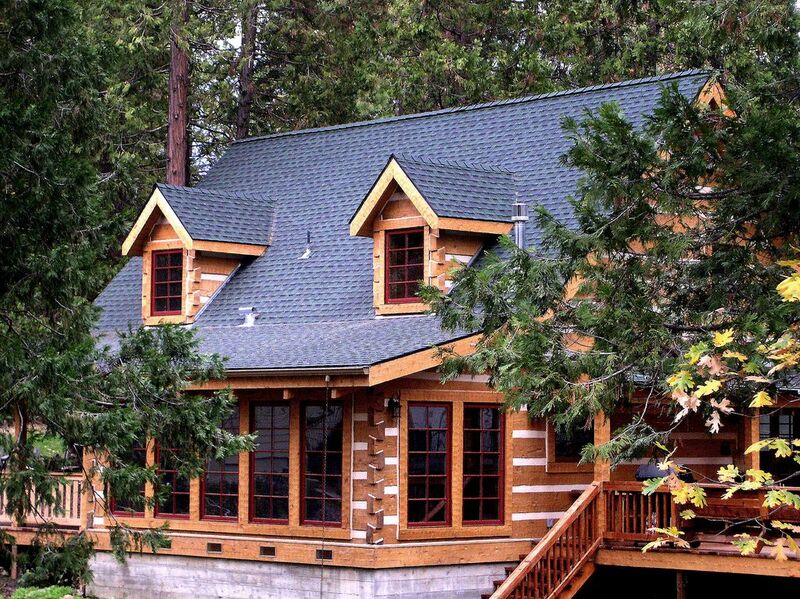 Our cabin is nestled in the pine trees on .71 acres surrounded by the Central Sierra Nevada mountain range. Telephone for local calls and emergency calls only. Toll calls are blocked. Central heat and gas burning fireplace. Front-loading, stacked 'HE' washer in unit. High-efficiency 'HE' detergent required. Front-loading, stacked dryer in unit. WIFI available and ROKU box available in master bedroom. For your convenience, our cabin is stocked with cooking oils, vinegars, teas, spices, and an assortment of disposable cooking wraps and ziploc bags. We ask that you replace what you run out of. Gas oven/stove. Garbage disposal. All kitchen utensils and cookware are provided. Eat indoor in great room or outdoor on back deck. Four televisions with cable in the great room, master bedroom, guestroom and bunk room. WIFI provided. Several rooms include DVD/VCR players. There are a several family-rated VHS videos and DVDs available. We have a wooded grove area in front of cabin with adirondack seating and twinkle lights around the perimeter. There is à front porch which leads to the entry to the sun room and to a private entry to the guestroom. Outdoor umbrellas are provided for shade on the back deck. Built-in and movable benches provide seating on back deck. Rinnai on-demand water heater. Claw-foot bathtub in master bath. This is a great cabin. We’ve been coming to Bass Lake for 12 years and change cabins usually every year or two. This is one of the best we have stayed at. Lots of parking. Nice entry area. Living room, dining table and kitchen are in a combined space. Downstairs has a bathroom, bedroom and room with bunks. Upstairs is an amazing master and bath along with a loft for two twin beds, each with a trundle. WiFi worked great. The deck was large. Definitely recommend it for the price if you want to be close to everything. My family and I had a delightful time making memories in your lovely cabin. We especially enjoyed the convenient location to the shopping and dining facilities. Your cabin was “squeaky” clean and that made our stay even more enjoyable! I would definitely recommended a stay at your Bass Lake cabin! We stayed at this cabin in January and had an amazing time!! The cabin was clean, in a perfect location and had everything we needed. There were 2 families and it was perfectly set up for that! Next time we'd love to come in the summer to fully take advantage of the great deck and yard! Allison was very kind and accommodating and accessible if needed during our stay. We would absolutely recommend this cabin to everyone! No surprises for this place. It looks just as it does on the website. Very close to the pines resort, restaurants, the lake, launch ramp etc. which makes things convenient. Plenty of parking for multiple families. Allison is great to work with and very responsive to any and all questions. We plan to return someday. This was our 4th or 5th time staying at the Mount's cabin, we love it. As always everything was clean and well stocked. The owners are awesome and very responsive should you have a question or need something. It's an easy walk to the Pines Resort where you can rent a boat, personal watercraft or pick up any items at the market that you may have forgotten to bring. There are plenty of day use beaches within a 5 minute car ride. Yosemite is about an hour away. Would definitely recommend this property. The ideal log cabin near the Bass lake. Well fitted out for 6 people, with all facilities as you would require, the cabin is very comfortable and is 5 minutes away from the bass lake. We had a wonderful time and the authentic atmosphere of the cabin was an added bonus. Our cabin is just a 20 minute drive to the southern entrance to Yosemite National Park and Mariposa Grove. We are centrally located for a day trip to the Yosemite Valley or Badger Pass. Additional terms are defined on the rental agreement. Cancellation policy defined on the rental agreement. Please contact owner prior to on-line booking at basslakelogcabin@live.com or 805-441-5869.